How is Competitive Landscape helpful to researchers for creating an effective R&D strategy? To answer this question in its truest sense, we need to understand what competitive landscaping really is (and while we do that, it would be fun to shatter a few myths in the process). Competitive Landscaping is often construed as complex analysis involving crunching of a lot of numbers. So, some think it to be suitable only for those with tons of hours to spend, high level of training in data analytics and expert landscaping techniques. By looking at this premise, often R&D people feel discouraged to take a deep dive into competitive space. Whereas the reality is otherwise. This premise is majorly false and it doesn’t address various reasons and extent of benefits you can juice out of a competitive landscape. Competitive landscape analysis has a lot to offer. Especially for R&D community. But first, you need to join me on a stroll down the landscape lane so that together we can figure how competitive landscape helps refine their R&D strategy. How Understanding Competitors’ R&D Strategy Helps? In today’s era of cut-throat competition, the only way an organization’s R&D team can stay ahead in research is if they already know R&D strategy of their peers and have an intel of what their peers are innovating. Slightest slack can prove to be deadly and leave one mile behind in an aggressive marketplace. Let’s take the example of Qualcomm and Samsung in Li-Fi domain. Li-Fi is getting more recognition all over the world nowadays and is on the way to becoming a mainstream communication technology in IOT. Samsung understood this, long back in 2008, when there was not much fuss about it, even when the term Li-Fi was not coined. As a result, now Samsung hold base patents in Li-Fi which are so fundamental to the technology that any company who will try to capitalize on Li-Fi would have to first get a license from Samsung. Whereas, Qualcomm, being one of the top innovators in communication space, seems was not aware of the moves Samsung made and entered the domain pretty late in 2012. Sometimes the direction of innovative efforts of a competition could be figured from their patent acquisition strategies as well. Tech transfer has always been a key element in understanding whether a competitor is aiming to exponentially increase their IP in some domain – which can help guess their IP expansion strategy, and also present licensing opportunities in case you already have some patents in the domain. For example – In the domain of hybrid electric vehicle Toyota has acquired two patents from Denso on regenerative breaking, which can be very important in future and can decide on their whole research direction in regenerative breaking. In a similar manner, Studying company acquisitions by competition can also help forecast the potential future research areas of a particular company. For example – in August 2013, Imperial Tobacco (more precisely its child company Fontem Ventures) acquired Dragonite, previously owned by Hon Lik, the Chinese pharmacist who claimed as the inventor of e-cigarette. This clearly portrayed Imperial Tobacco’s interest in RRP domain and its expansion plan. Later these patents were used by Imperial Tobacco to sue every large e-cigarette company in the state of California. Handpicked Suggestion: Are R&D and Business Strategies of Your Organisation Aligned? How Understanding Competitor’s Next Technology Move helps? During our experience of working with researchers or R&D department from different companies or funding agencies, we understood that R&D people usually have a tunnel vision. They can see a long way into the tunnel, but their field of vision is usually limited by the tunnel boundaries. So, often they tend to miss that their competitor might have already shifted to some other superior technology line. 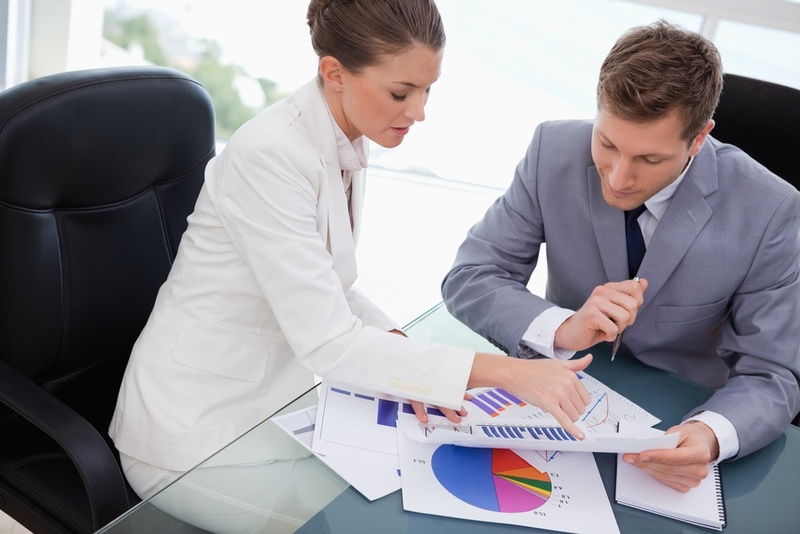 Competitive analysis helps you stay updated in this perspective. More precisely, knowing whether the competitor is going after an alternative technology for a known problem can help you in vetting the possibility of whether the solution being explored by the competitor is a superior one or not. Based on that you can take the decision as to whether pursue your own tech or go after the alternative tech. For example, let’s take the domain of wireless charging. 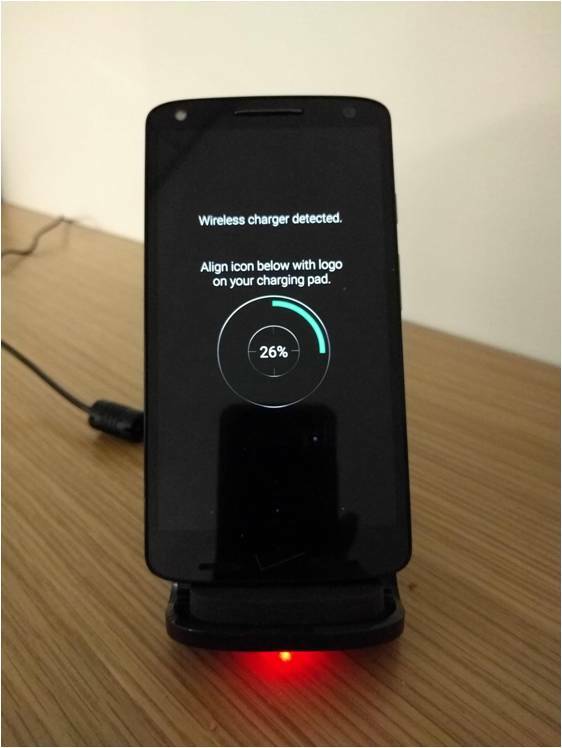 One severe issue in the domain of wireless charging is related to alignment. Let’s see how Apple and Motorola are trying to solve this problem in two different ways. Apple is trying to solve it by introducing a ferrofluid layer between the receiver and transmitter coils in an inductive charging system. The ferrofluid layer aids in focusing the magnetic flux between the coils and reducing/eliminating losses due to misalignment of coils. (US9479007B1). How Understanding Feature Addition to Competitor’s Existing Product Line Helps? Many a time, we noticed that focus of R&D personnel becomes very narrow – limited to their own operating technology domain. It is often called the curse of knowledge. This is where they fail to see how other technologies being developed in similar or different application areas can instill ideas related to patenting new features for their own product/brand. In this regard, we noticed that researchers find new features being incorporated into the existing products of competitors particularly helpful in deriving new features for their own product. For instance, a recent patent (WO2016075747A1) from Japan Tobacco claims the feature – a user gets notified if the cartridge needs replacement. This feature can be applied to any of their existing e-vapor/ heat-not-urn/inhaler type products. Or a patent from RJR, US9095175B2, which claims automatically switching on the e-cigarettes when kept in the mouth, which can very well be tapped into their existing e-vapor product line. How JTI or RJR are advancing their product line? Can they also integrate these ideas wholly or partially in their own product line? Are there any other solutions for the same problems stated in these patents? Are the problems solved in these patents important? If there are no other solutions to these problems, can they enhance these innovations somehow? Can they get some solution from other domain where X has been implemented long ago? How Understanding Competitor’s Technology Collaboration Moves help? Collaboration and acquisition related details of competitors are possibly the most ignored aspect in an R&D strategy. It is believed that such aspects are related to mostly IP and business strategy of the company. Whereas we noticed that when we showcased the researchers on what technology their competitors are gathering IP from or companies they are collaborating with, often triggered ideas on adopting the solutions to the crucial problem they are trying to solve. IP benchmarking also helps in this process by getting actionable insights on what your competitors are doing. 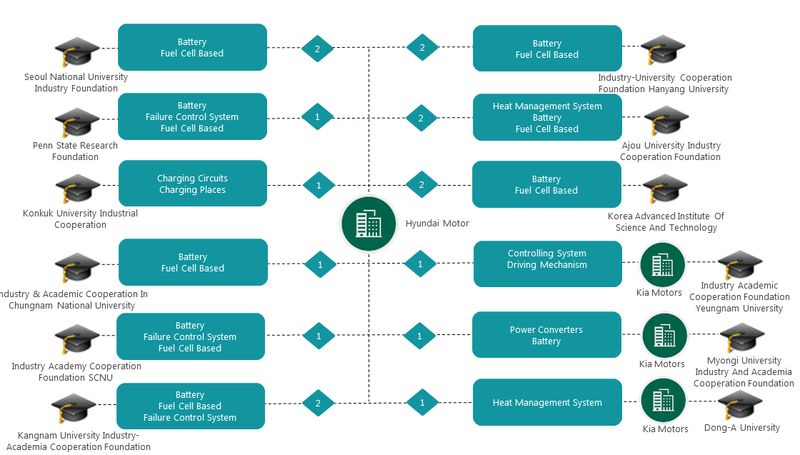 From this chart, it is very clear that Hyundai Motor is very keen in developing their Fuel cell battery related technology and thus collaborating for developing new solutions, au contraire their own patents which are more focused on other battery technologies. It is possible in the future that Hyundai Motor might be one of the top players in Fuel Cell Battery Domain. In a similar manner, competitive analysis of other companies could reveal the possible next technology move by an organization and help researchers keep track of where the competition is innovating. We live in an era where competition comes before innovation. Innovation, though, is the focus word of researchers, it should not be undermined that any innovative products that resulted from an R&D lab would not be a success unless the products have earned a huge share in the marketplace. It goes unsaid that the only products that earn a lion’s share are the ones that are first to enter the market or are way better than the products competition has to offer. For either of the above scenarios to occur, it is important that researchers keep an eye on their competitor’s moves, understand their R&D strategies, predict their futuristic additions so that their research strategy could be developed accordingly. Given that researchers are busy innovating and they do not have time to keep track, this is when getting a competitive landscape study performed would come in handy. Authored by: Arindam Som, Group Manager, Operations. Read Next: How we helped Peter, a senior R&D manager at one of the Fortune 500 companies, find a solution to one of the prominent problems in wireless charging.